Everybody agrees that Kenya newspapers belong to the best of Africa. Some of them maintain good websites so it's easy to stay updated about Kenya news. The best selection of Kenya news headlines are automatically displayed on this website on my Kenya news page. 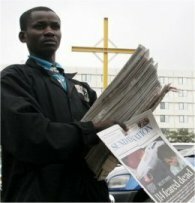 The Daily Nation is seen as most influential of all Kenya newspapers. It has a market share of about 75%. It has a reputation of being independent and unbiased. It maintains an excellent website, accessible at no charge. The Daily Nation is privately owned by the Nation Media Group, which also owns Nation TV, the radio station Nation FM, and several smaller newspapers. The English language Daily Nation was started by Aga Khan IV in 1960 as part of the struggle against colonialism. See my separate page about the Daily Nation. The East African is a weekly newspaper published by the Nation Media Group. It is mostly directed towards business news. Many articles are also published on it’s website. Business Daily is a daily newspaper of the Nation Media Group directed, not surprisingly, towards news for the business community. It’s current managing editor is Nick Wachira. Offices are based in Nairobi. About one third of it’s articles are also published on it’s website. It is a partner of the Wall Street Journal and has it’s own network of foreign correspondents. This newspaper was started as the Nairobi Times. In 1983 it was bought by Daniel arap Moi’s government, rebaptized Kenya Times, and turned into a mouthpiece of Moi’s ruling party KANU. This happened 42 days before Moi dissolved the Parliament and called for early elections. When Moi had to introduce multi-party elections in 1992, the paper entered a difficult period and now it’s only a shadow of it’s former image. However, with the profits in Kenya’s media sector on the rise, several businessmen have showed renewed interest in the newspaper. It’s website is apparently out of the air. Coastweek is a weekly newspaper featuring news, entertainment, sports, shipping information, tourist information, and more. It is based in Mombasa. It’s website is to a large extent geared towards tourists, reason why it also has a German version. The Nairobi star is the latest addition to Kenya’s print media. The first issue of this tabloid, which is published daily from Monday to Saturday, appeared on July 3, 2007. It has promised to become the “benchmark of gossip” and until now it’s living up to it’s word. It is owned by Patrick Quarko. It has promised to open a website soon. A daily newspaper owned by veteran politician Kenneth Matiba. It apparently does not have a website.